Parts of the Raccoon River Valley area are seeing a higher risk for potential severe weather later today. 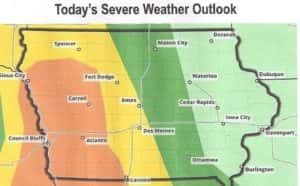 The National Weather Service reports the western third of Greene County and the majority of Guthrie County are at an “enhanced” risk for severe weather, while Dallas County is in a slight risk. An “enhanced” risk means that numerous severe thunderstorms are possible, with some being intense. The primary timing for severe weather is between 3 and 11pm. The potential hazards with the possible storms include: large hail and damaging winds, with heavy periods of rainfall. The rainfall could also lead to flash flooding locally. Rainfall could potentially reach one- to two-inches per hour, and in some cases two- to three-inches per hour. 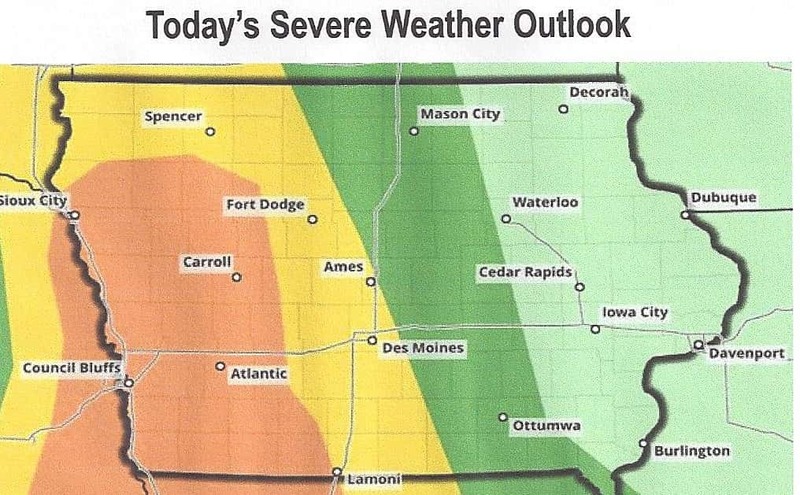 Raccoon Valley Radio’s Severe Weather Action Team provides live coverage anytime there is severe weather in Greene, Dallas and Guthrie counties. We also provide road conditions and cancellation and postponement information during each severe weather incident.